This study was conducted to obtain a detailed anatomy of the trachea in Kangal dogs, for the first time using computerized tomographic images. In this study, 5 male and 5 female total 10 adult Kangal dogs were used. The images obtained from a multidetector computerized tomography device (MDBT) were used for 3D reconstruction of the trachea with the 3D modelling software (VITAL, Vitrea 2, HPXW 6400). The measurements of the trachea were made from the cranial and caudal points determined at the cervical and thoracal regions. Transversal and vertical diameters of the trachea taken from 4 different points , the ratio of these diameters (T/V) and cross sectional areas (CSA) , were measured by CT (computer tomography) scanner software. A significant statistical difference was not found between males and females. An increase in the diameter of the trachea at the beginning and terminal parts was observed. It was found that the transversal diameters were greater than the vertical diameters at all measuring points. In the 3D modelling, trachea has been found to be dorsoventrally flat with an incomplete elipsoid form. It is thought that this work, which was first made in Kangal dogs, may be a source for similar work in the anatomy. Bu araştırma; Kangal köpeklerinde ilk kez bilgisayarlı tomografik görüntüler kullanılarak trachea’nın ayrıntılı anatomisini elde etmek amacıyla gerçekleştirilmiştir. Çalışmada 5 erkek ve 5 dişi olmak üzere toplam 10 erişkin Kangal köpeği kullanılmıştır. Multidedektör bilgisayarlı tomografi (MDBT) cihazından elde edilen görüntüler, üç boyutlu (3D) modelleme yazılımı (VITAL, Vitrea 2,HP XW 6400) ile trachea’nın üç boyutlu yeniden yapılandırılmasında kullanılmıştır. Trachea’nın ölçümleri; hem pars cervicalis hem de pars thoracalis bölgelerinde; cranial ve caudal noktalar belirlenerek yapılmıştır. Trachea’nın 4 noktasından alınan transversal ve vertical çap ölçümleri, bu çapların birbirlerine oranı (T/V) ile kesitsel lümen alanları (crosssectional area CSA), BT (Bilgisayarlı tomografi) tarayıcı yazılımı ile ölçülmüştür. Erkekler ve dişiler arasında önemli bir istatistiksel fark bulunmamıştır. Trachea’nın başlangıç ve bitiş kısımlarında çapların arttığı gözlenmiştir. Transversal çapların bütün ölçüm noktalarında vertical çaplardan daha yüksek değerlerde olduğu tespit edilmiştir. Üç boyutlu modelleme ile trachea’nın dorsoventral basık ve tam olmayan elipsoid şeklinde olduğu ortaya konmuştur. Araştırmanın ilk kez yapılmış olması sebebiyle, anatomi alanındaki benzer çalışmalara kaynak teşkil edebileceği düşünülmektedir. Anonim,2017:https://www.researchgate.net/publication/263468806_Turkish_Kangal_Karabash_Shepherd_Dog_in _English/, Erişim tarihi; 23.03.2017. Atalar Ö, Koç M, Yüksel M, Arkaş AA, 2017: Kangal köpeklerinde pelvis boşluğunun bilgisayarlı tomografi ile üç boyutlu değerlendirilmesi. F Ü Sağ Bil Vet Derg, 31, 105-109. Brovida C, Castagnaro M, 1992: Tracheal obstruction due to an eosinophilic granuloma in a dog, surgical treatment and clinicopathological observations. J Am Anim Hosp Assoc, 28, 8-12. Burk RL, Ackerman N, 1996: Small Animal Radiology and Ultrasonograph. A Diagnostic Atlas and Text. Philadelphia, Saunders. Carlisle CH, Bilry DN, Thrall DE, 1991: Tracheal and laryngeal tumors in the dog and cat, literature review and 13 additional patients. Vet Radiology, 32, 229-235. Chen JD, Shanmuganathan K, Mirvis SE, Kileen KL, Dutton RP, 2001: Using CT to diagnose tracheal rupture. Am J Roentgenol, 176, 1273-1280. Coyne BE, Fingland RB, 1992: Hypoplasia of the trachea in dogs. J Am Vet Med Assoc, 201, 768-772. Dallman MJ, Brown EM, 1984: Statistical analysis of selected tracheal measurements in normal dogs and dogs with collapsed trachea. Am J Vet Res, 45, 1033-1037. 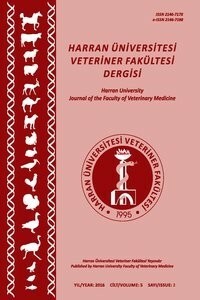 Dyce KM, Sack WO, Wensing CJG, 2018: Köpek ve Kedide Thorax. In: Hazıroğlu RM, Çakır A. (Editors). Veteriner Anatomi Konu Anlatımı ve Atlas 4. Baskı, Güneş Kitabevleri: Ankara. Dursun N, 1996: Veteriner Anatomi II. 3. Baskı, Medisan Yayınevi, Ankara. Evans HE, 1993: Skeleton. In “Mille’s Anatomy of the Dog”, Ed; Evans HE, Philadelphia, USA. Fike JR, Druy EM, Zook BC, Davis DO, Thompson JE, Chaney E, Bradley EW, 1980: Canine anatomy as assessed by computerized tomography. AmJ Vet Res, 41, 1823-1832. Fingland RB, Layton CI, Kennedy GA, Galland JC, 1995: A comparison of simple continuous versus simple interrupted sutura patterns for tracheal anastomosis after large-segment trachea1 resection in dogs. Vet Surg, 24, 320-330. Getty R, 1975: The Anatomy of the Domestic Animals. 5nd Ed., Rosenbaum CE, Hillmann D, Philadelphia, USA. Griscom NT, Wohl ME, 1986: Dimensions of the growing trachea related to age and gender. Am J Roentgeııol, 146, 233-237. Hedlund CS, 1984: Tracheal anastomosis in the dog comparison of two end-to-end techniques. Vet Surg, 13, 135-142. Huber ML, Henderson RA, Finn-Bodner S, Macintire DK, Wright JC, Hankes GH, 1997: Assesment of current techniques for determining tracheal luminal stenosis in dogs. Am J Vet Res, 58, 1051-1054. Johnson LR, Krahvinkel DJ, Kiernan BC, 1993: Surgical management of atypical lateral tracheal collapse in a dog. J Am Vet Med Assoc, 203, 1693-1696. Kara ME, Karaman ZC, Dabanoglu I, Ocal MK, 2001: Computed tomogaphic measurements of the trachea in dog. Dtsch Tierarztl Wschr, 108, 164-167. Mori M, Ikemune MD, Hiasa H, 2001: Stenosis of the trachea caused by retrosternal ossification. Ann Thorac Surg, 71, 1035-1037. Nelson WA, 1993: Lower Respiratory System. In: Slatter D (Editor) Textbook of Small Animal Surgery. Philadelphia: Saunders. Nickel R, Schummer A, Seiferle E, 1979: The Anatomy of the Domestic Animals Volume 2, The Viscera of the Domestic Mammals. 2nd Revised edition by August Schummer, Richard, Wolfgang Otto Sack, Heidelberg,Berlin. Nomina Anatomica Veterinaria, 2012: Prepared by the International Committes on Veterinary Gross Anatomical Nomenclature and Authorized by the General Assambly of the World Association of Veterinary Anatomists, The Editorial Committee Hannover, Sapporo, Japan. Roditi GH, Weir J, 1994: The association of tracheomegaly and bronchiectasis. Clin Radiol, 49, 608-611. Röcken H, Röcken M, 1994: Foreign body in the bifurcation trachea in a dog. Berl Münch Tierarztl Wschr, 107, 121-123. Rudorf H, Herrtage ME, White RAS, 1997: Use of ultrasonography in the diagnosis of tracheal collapse. J Small Anim Prac, 38, 513-518. Salisbury SK, Forbes S, Blevins WE, 1990: Peritracheal abscess associated with tracheal collapse and bilateral laryngeal paralysis in a dog. J Am Vet Med Assoc, 196, 1273-1275. Shamberger RC, Holzman RS, Griscom T, Tarbell NJ, Weinstein HJ, 1991: CT quantitation of tracheal cross-sectional area as a guide to the surgical and anesthetic management of children with anterior mediastinal masses. J Pediatr Surg, 26, 138-142. Shih JY, Lee LN, Wu HD, Yu CJ, Wang HC, Chang YL, Yang PC, 1997: Sonographic imaging of the trachea. J Ultrasound Med, 16, 773-790. Smith MM, Gourley IM, Amis TC, Kurpershoek C, 1990: Management of tracheal stenosis in a dog. J Am Vet Med Assoc, 196, 931-934. Van Pelt RW, 1988: Confirming tracheal hypoplasia in huskymix pups. Vet Med, 83, 266-273. Walter PA, 1990: Alternative Imaging Technologies Computed Tomography. In: Lavin LM (Editor). Radiography in Veterinary Technology. Philadelphia: Saunders. Watt PR, 1992: Congenital tracheal collapse in a young fox terrier. Aust Vet Pract, 22, 112-116. White RAS, Williams JM, 1994: Tracheal collapse in the dog is there really a role for surgery? J Small Anim Prac, 35, 191-196. Yılmaz O, 2017: Turkish Kangal (Karabash) shepherd dog (in English). https: //www.researchgate.net/ publication/ 263468806, Erişim tarihi; 23.03.2017.